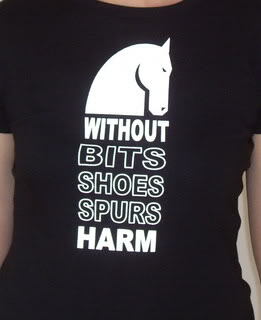 On the EP forum they were talking about making T shirts with slogans for people who have their horses barefoot. I have a feeling that there is a great one in my head somewhere but it hasn't surfaced yet! So get your thinking caps on... what would yours be? No suggestions but perhaps cafepress might help you make the t-shirts a reality. No Bits in my mouth please!!!! No shoes, no bit, no tree - my horse runs metal free! No tree, no shoes, no bit - NO S@*T! LOL these are ace! Knew you guys would some up with some good stuff! Heehee....! so next stop a T shirt company that will prints them up! barefoot and bitless - the natural look. There are a couple of really neat t-shirts on this site. 5 healthy hearts the barefoot way. Wow, there are really good ideas here! I like "5 healthy hearts the barefoot way"
We have designed a shirt as well. It is being well received and I love wearing mine. raised...the sanctuary is home to 36 rare Kaimanawa horses. There is a story about how we came with the design, if anyone is interested. of course we're interested! tell us more. Hey, those shirts look great! I will be posting an upcoming barefoot clinic here in the next few days and I think shirts may be in order for the participants at the end of the clinic! Does anyone mind if I take those ideas and make up shirts on my own? Great! Happy to share with you. This is a link to a PDF doc explaining more about how and why we came with the design. and I would be happy to give you guys a discount price of $20 AUD (normally $26). who is incidentally also a barefoot trimmer and supporter of ethical horse teaching systems. HorseHippie- I don't mind you borrowing our idea if you like it. Thanks for asking! would be great if you sell any to give something to the sanctuary. If we don't raise enough money by April 09, then the 36 horses we are trying to help will be culled. Oh for sure, I will definately make sure that I make people aware of the cause it shirt sales will support! know that you are helping to raise funds for the sanctuary. She is a really wonderful person with an important job to safeguard those horses.